Barcode Ready Financial Accounting Software (Enterprise Edition) is fully capable to maintain all Company Financial accounting, Bookkeeping, Billing, and Inventory information, everything at one place with barcode support. Maintains your business accounting details and provide accurate information without any complicated results in the easiest way. 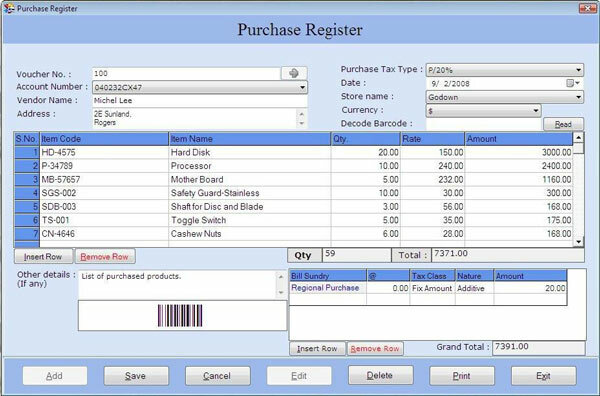 Easy to use advance inventory and invoicing management software preserves and categories your customer, vendor and product details in most simplified manner so that you can easily access any of your accounting and billing records within few mouse clicks. You can get rid of time consuming manual data entry process which is more prone to error with the help of additional barcode functionality results in improving your business efficiency and increase productivity. Professional billing accounting utility helps you to track all your business dealing (with your customer and vendors) and bookkeeping records (about item, stock, production) in most systematic way. Customized business accounting program allow you to access any of your business book keeping record as per your convenience (date wise, name wise, account wise etc.) that helps to check your business financial status by creating a wide variety of printable accounting reports (Final report, Account report, Stock report, Sale report, Purchase report and various other useful reports). 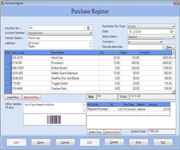 Advance accounting software is extremely useful for small businesses and individuals. Record all vendor, customer and stock related information and enable to access it with just a few clicks with barcode feature. You can quickly create sale and purchase information in respective voucher entry. Create a working financial plan automatically, based on your stored information about business need with time and date. Software keeps you regularly updated about your business transaction activities. One of its unique features of multiple-user functionality enables more than one person (administrator, power user, normal user) to work on a company file, increasing teamwork and production. Software is password protected so that no one except administrator can change or modify the company accounting records. No additional accounting training is required to operate the software with its user friendly GUI interface. Free Download 30 day’s evaluation version of Barcode Ready Financial Accounting Software (Enterprise Edition) from the link given below to fully understand the software functionality and features. Upon satisfying, you can order for the full version.